Houston Safe and Lock is proud to be an authorized dealer and service center for Medeco High-Security Locks and Deadbolts. We are the only locksmith in Houston that offers a complete line of Medeco residential and commercial locks and deadbolts. Stop by our showroom or give us a call at 713-659-3951 to schedule an appointment with one of our licensed, bonded & insured locksmiths. Bump Resistant. Pick Resistant. Serious Security. 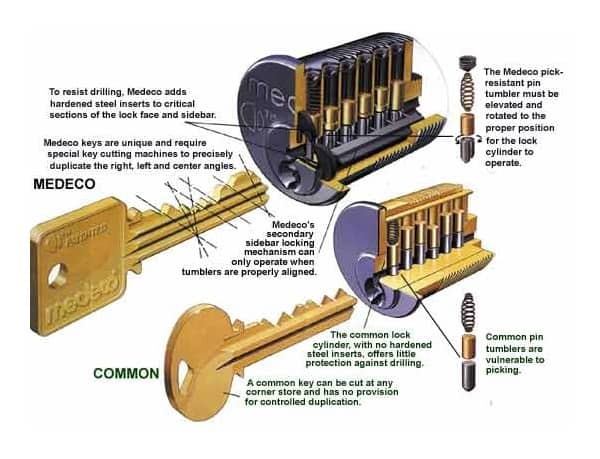 Medeco uses a patented key control system, which includes patents on the keys and the cylinder, to prevent unauthorized copies of keys from being made. Medeco’s patented lock design must have the angled cuts of a key to elevate and rotate the pins inside of the lock in order for the sidebar to drop, which is what allows the lock’s cylinder to turn. The pins have unique chiseled tip cuts which allow the pins to be rotated by the angled cuts on the key. There is a slot along the length of the pin from the sidebar to drop into once the pin has been rotated to its correct orientation. Medeco padlocks offer a high-security solution for a variety of indoor and outdoor applications. Available with or without a shackle, Medeco padlocks are made from a boron alloy steel that provides protection and resists cutting and pulling. The cylinders are comprised of hardened stainless steel, which stands up to various forms of vandalism. Medeco’s patented key control system prevents unauthorized duplication of keys, which maintains system integrity. Best of all, Medeco high-security padlocks can be keyed alike, different, or master keyed to match current hardware. Medeco X4 Interchangeable Cores provide utility and patented key control for high-security applications. Using a control key, the cores are instantly removable and replaceable. They are designed to be convenient and user-friendly. A Medeco X4 Interchangeable Core is the perfect high-security lock solution for facilities and businesses with high turnover rates and is also recommended for hospitals, schools, and offices that require strict key control. Cylinders are changed quickly and easily by personnel by using a control key which removes the core from the lock housing. A core with a new set of pins is inserted and the lock is then re-keyed. This procedure is completed without having to take the lock apart, which reduces expense by eliminating the need to call outside technical locksmith services to perform routine re-keys.